Hello, I'm back! I didn't think I'd pick up blogging again, as so much has happened over the past year and I didn't think I'd be in the mood to write again... but this is such positive, happy news I wanted to share it with you all. I am expecting a baby! There is a bit of story here as I am diagnosed with PCOS but this is something I will talk about another time. 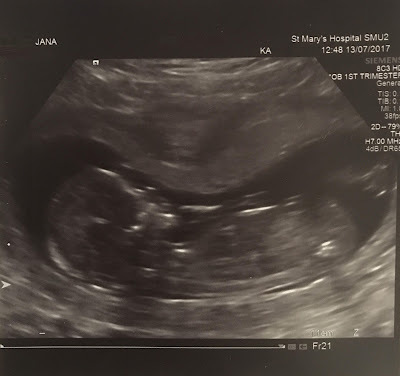 To be honest, Tristan and I didn't expect that it would happen so soon, so it was such amazing news for us when we found out that I was pregnant in early May. It was a week before our holiday to Australia and I felt double excited (more about the baby of course). We decided to keep it between us until I had my hospital appointments, scans and knew how many weeks along I was. Unfortunately there wasn't enough time to book an appointment with my local GP before our trip, so I went to see a private doctor. I wanted to get some peace of mind, find out what to expect in the coming weeks and what my next steps would be once I returned from holiday. I felt absolutely fine until we landed in Australia. I immediately started feeling exhausted, tired and on top of that my morning sickness kicked in. The jet lag didn't help and only made things worse. I was about 6 weeks pregnant at that time; I felt normal but at the same time I wasn't myself at all. I'm usually very active and barely ever ill, so I felt a bit down over the rest of the trip. Tristan was very supportive of course, he really helped me through this. He was really patient with me the whole time, looking after me, making sure I got rest, ate properly and urged me to enjoy the holiday as much as possible. When we arrived back home I was still feeling nauseous, tired and I was sick pretty regularly. I started calling it evening sickness as during the morning I was fine but as soon as it reached the evening I became best friends with the toilet. Luckily it didn't interfere with my work and I think there was only ever a single time when I had to leave my desk and run to the bathroom. I started feeling much better around week 12, my energy slowly started coming back and I was less sick. At week 13 we had our first scan at the hospital. I was a bit late with my appointments and luckily they managed to do an NT scan and take my blood for further examination. Tristan was with me the whole time and I felt less nervous. Once we saw the baby on the screen, seeing the little feet and tiny heart beating it made it so real! This was the moment when I realised we were going to be parents! After all of the sickness and tiredness it felt suddenly like a reward. Here is a picture of our little one!